A dentist should check your baby’s teeth and mouth within six months of the first tooth breaking through the gums. At this first visit, the dentist will examine your baby’s mouth. They will also explain how you should care for your baby’s teeth and mouth, and inform you about your baby’s diet. Dental decay can happen to any baby and is an infectious disease. It occurs when bacteria in the mouth interacts with the sugars present in milk and fruit juices. This process produces acids that can be destructive to teeth. You can prevent this by making sure you clean your baby’s teeth after a feeding. One of the best ways to clean your baby’s gums is to wipe them with a damp gauze sponge immediately after a feeding. This removes food material from the gums, and reduces the amount of harmful bacteria in the mouth. You should keep following this routine when your baby’s teeth first start to erupt. When at least four teeth in a row have broken through your baby’s gums in the lower or upper jaw, you can start using a toothbrush for their oral hygiene. You should brush your child’s teeth until they have enough strength and coordination to brush by themselves and when they are able to do so they should be supervised. Mild dental fluorosis looks like white flecks on the surface of the tooth. In severe cases, brown mottling appears on the teeth. Dental decay can be prevented if you use proper feeding and oral hygiene practices for your baby. 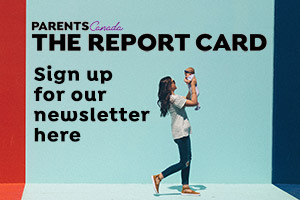 The Canadian Dental Association (CDA) recommends that no fluoride supplements be given to children under six years. Fluoride-free toothpaste is recommended for children under six years because most children can’t spit properly until then. If they swallow the toothpaste they run a higher risk of fluorosis. 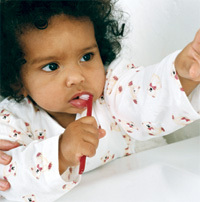 If fluoride toothpaste is used to brush your child’s teeth, make sure you use only a pea-sized amount at each brushing. Brushing should happen twice per day.